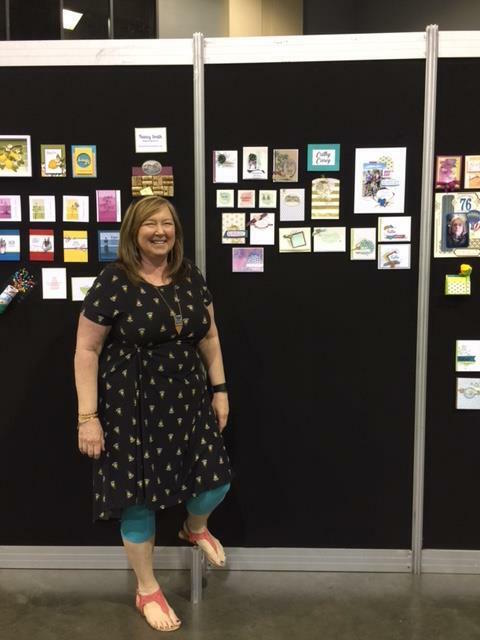 I was sooooo excited to be selected as a Display Stamper for the OnStage Local event in Savannah! I get to play with new product and make a fun display?? Why yes, that sounds amazeballs! I opened my box of goodies when they came and had a little party all by my ownself looking at all the fun new toys….then came the trepidation….how can I make something cute and worthy for the boards??? What if I can’t come up with all these projects???? Yikes! Today’s card is the first of my display projects that I will be sharing over the next days & weeks. This card features lot’s of new product and colors. The stamp sets used are from the current catalog: Falling Flowers and All Things Thanks. New products featured are 2017-2019 In Colors Lemon Lime Twist and Berry Burst, Glossy White Cardstock, Eastern Palace Designer Series Paper, Corrugated Elements and 1/4″ Ombre Ribbon. Glossy paper can be used many ways. On this card, I chose to white emboss the flourish image from Falling Flowers on the card front giving the tone on tone look for my background. I added one tiny heart in Berry Burst to the Corrugated Element heart. This heart comes from the row of hearts in the Everyday Jars Framelits set. 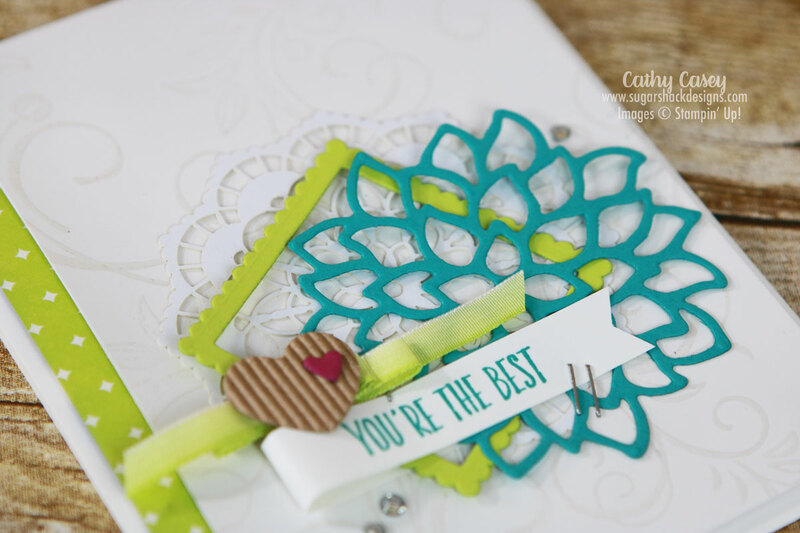 The little pop of Berry Burst sets off the blue and green tones in the Lemon Lime Twist and Bermuda Bay prevalent in the rest of the card design. 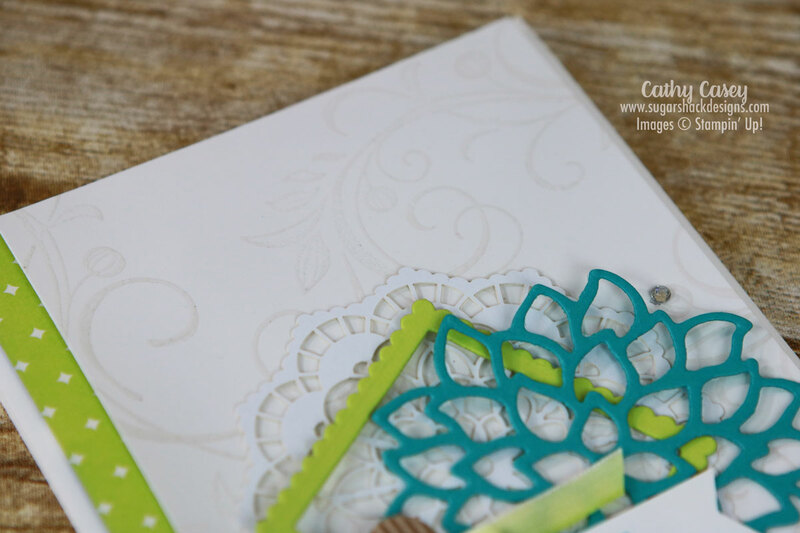 Layering of several simple elements adds interest and a focal point to the card. I love being able to see images and backgrounds through and under other elements. The flower die cut from May Flowers is perfect for this! Such a fun card! 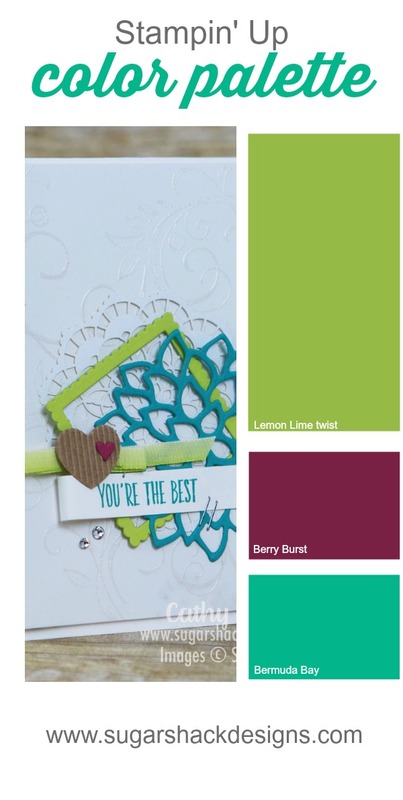 I love how well the new Lemon Lime Twist coordinates with my favorite color, Bermuda Bay. They just feel vibrant and alive on the page! I hope you love my card as much as I do! 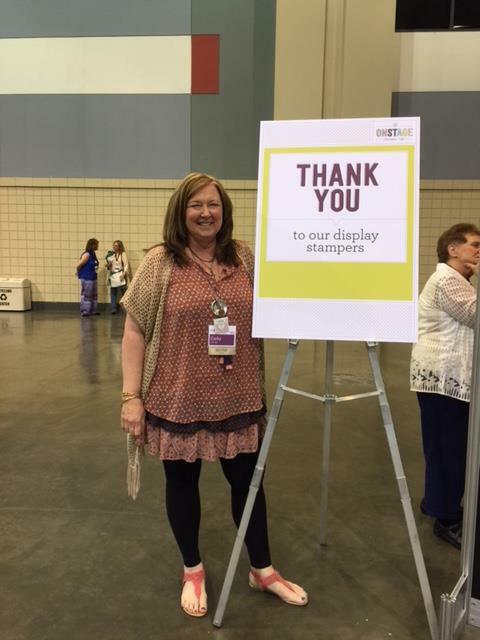 Stay tuned for more fun projects featuring new product coming out June 1st! The Eastern Palace Suite will be available to order on May 1st!!! 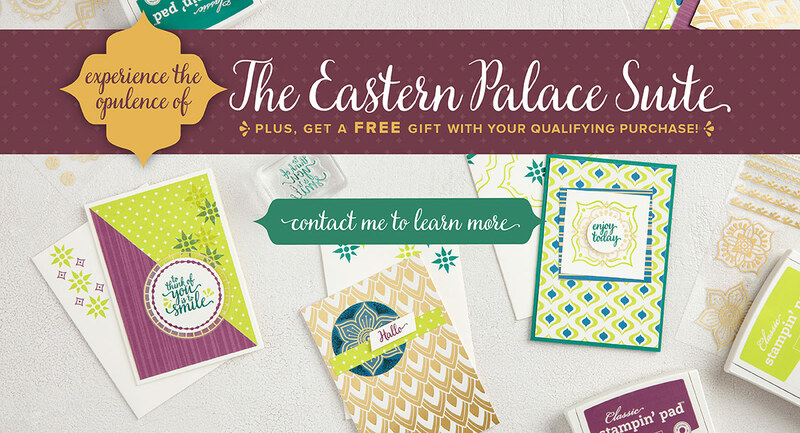 It includes the yummy Eastern Palace DSP and a great stamp set and coordinating framelits. This entry was posted in All Things Thanks Stamp Set, Big Shot, Cards, Falling Flowers Stamp Set, Framelits Dies, Stampin' Up, Techniques and tagged All Things Thanks, Falling Flowers, OnStage Savannah 2017, Stampin' Up by kate80132. Bookmark the permalink.